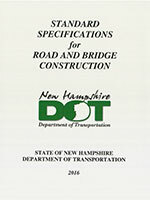 The current 2016 edition of the State of New Hampshire Department of Transportation Standard Specifications for Road and Bridge Construction is now available online. This 2016 edition of the NHDOT Standard Specifications for Road and Bridge Construction is in Adobe Acrobat PDF format file. Click on the link below, when the webpage has finished loading, right click anywhere on the screen. A small menu will appear select the option "Show Navagation Pane Buttons". On the far left side of the browser window you will see an icon that resembles a bookmark, select that, a menu will appear from which you can navigate to the Section that you need to view. Additionally there are links throughout the book that will bring you to other referenced locations within the book. 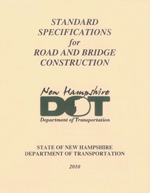 To purchase a hardcopy of the 2016 edition of the NHDOT standard specifications for Road and Bridge Construction, please contact our Records Section.